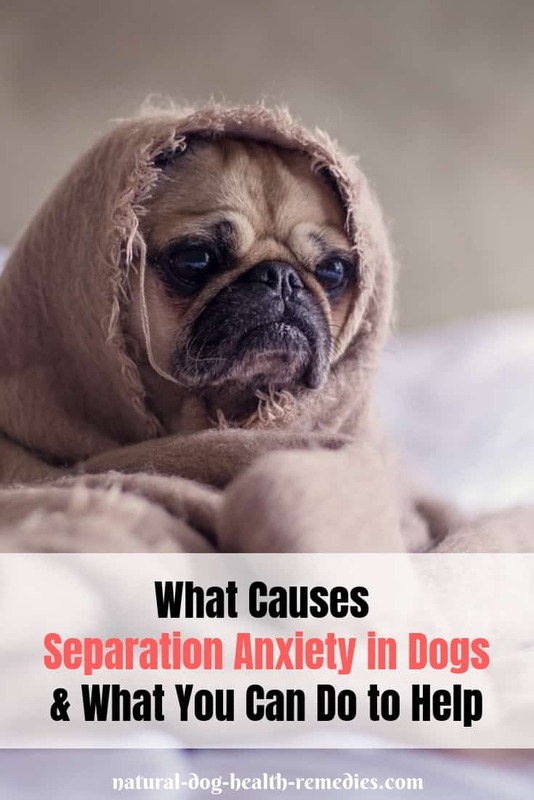 Separation anxiety in dogs is the most common type of stress and anxiety problem. It can cause an otherwise gentle dog to be high-strung and destructive. Dogs that are properly trained and socialized can handle being left alone as long as they get lots of TLC when their owners return. A dog is said to have separation anxiety when he shows signs of distress when you leave him alone. This feeling of distress usually begins when he sees signs of you getting ready to leave, e.g. when you are putting on your shoes or picking up your keys. Some dogs also show signs of anxiety when you put them in a room and close the door behind you. A Lack of Stability, Confidence, and a Fear of Abandonment - Separation anxiety is a common phenomenon among rescue dogs and dogs that have been mistreated in the past. Usually these dogs are nervous and not confident, and when left alone, they may think that they are being abandoned again. They get anxious thinking that they may not be able to survive. Jealousy - Some dogs get insecure and anxious when there is a new member in the family (e.g. another dog or a newborn baby). They respond by being ultra-clingy and sometimes destructive when left alone. Dominant Relationship - Some dog parents unknowingly allow their dogs to be the dominant "pack-leader" in their families. These dogs have a misconception about the social structure in the families and may feel anxious and upset when their "subordinate pack members" (other human family members) leave without permission. Sudden Change in Environment - A sudden change in an owner's work schedule or a change in living environment, e.g. moving to a new house or a new city/country, can also trigger separation anxiety in dogs. Dogs like routines, and if their routines are upset and changed, sometimes they feel anxious. Age - Older dogs also tend to develop separation anxiety. Improper Diet - A poor diet lacking in nutrients can prevent a dog's brain from functioning properly. This may lead to separation anxiety in dogs. 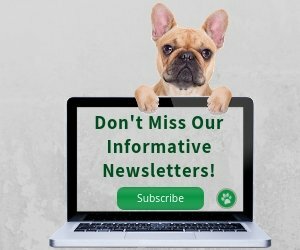 Physical Health Problems - If your adult dog suddenly develops symptoms of separation anxiety, it is possible that he is suffering from some health issues, such as thyroid or adrenal gland problems, parasites, tumors, diabetes, to name a few. Be sure to take your dog for a check-up therefore if your normally calm dog suddenly shows signs of separation anxiety. Chewing on their own paws, household objects, furniture, etc. If you repeatedly come home to find evidence of these behaviors, there is a very good chance that your dog is suffering from separation anxiety. It is important to consult a veterinarian as soon as possible in order to find out the underlying root cause of this phenomenon. Very often, identifying and dealing with the root cause (e.g. a change of diet) will be sufficient. Try to desensitize your dog so that he will get used to the idea of being left alone at home while you are at work. To train your dog, first just open and shut the door (without you actually going anywhere). Once your dog is fine with that, you can open the door, step outside for a moment, and quickly come back in. If your dog does not whine or get upset, remember to praise her a lot and give her a tasty treat. This positive reinforcement is very important. Finally, you can step outside and stay outside for a short time before re-entering the house. The time you stay outside is then slowly increased. You need to take it one step at a time and repeat each step until the dog does not react to it before you move on to the next step. In addition, it's helpful to keep everything very low key - do not make a big deal of your exits from or entrances into the home. Give your dog plenty of exercise - make him tired and happy and he will gladly go to sleep when left alone. Although it may be hard to do it every day, try to take your dog out for a long walk or jog before you leave your dog home alone. The aim here is to tire him out, so the walk or run should be brisk and at least 60 minutes. You may want to consider biking or scootering with him if your energy level is not as high as your dog! You may even want to consider getting your dog a treadmill. A radio can add some noise to an otherwise quiet house and can mask some of the noises outside as well. This may prevent a dog with separation anxiety from focusing too much on each and every single noise coming in from the outside. Fill a Kong toy with yummy treats and give it to your dog when you leave. This may make him associate good stuff (treats) with your departure. The toy can also keep him occupied for a while. Hopefully, by the time he is finished with the toy, he will have forgotten about you leaving! Also, give him several chew toys that you rotate every few days to keep him entertained. 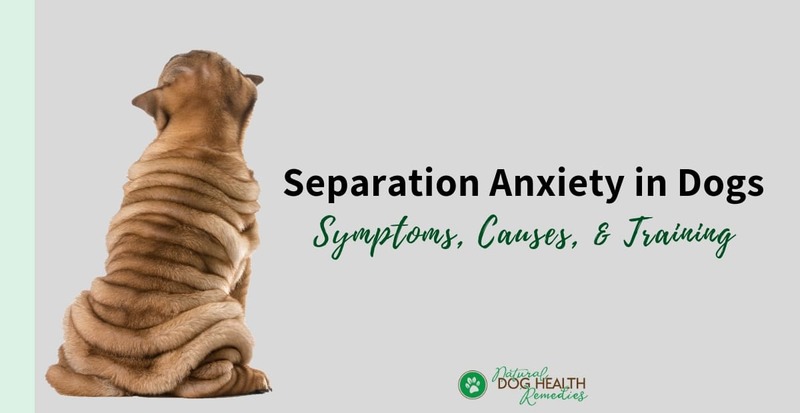 In severe cases of separation anxiety, it may be necessary to seek the help of a qualified veterinarian or animal behaviorist. Herbs are excellent in calming nervous dogs suffering from separation anxiety. Herbs are mild and non-addictive, and they do not cause drowsiness after use! Even better, some nervous-calming herbs are nutritious tonics, providing additional support to our dogs' nervous system. 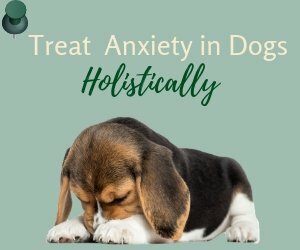 Homeopathic remedies are effective in the quick relief of symptoms associated with dog anxiety. 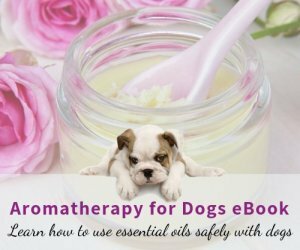 Click here for more information on using natural remedies to treat separation anxiety in dogs.